You can see full length picture of the gown Here! Go Here for her interview and more pictures! A lot more of the same! Its hard to miss the pattern here. Divya Dutta is a nice looking woman but her choices in clothes majorly let her down. We understand that she’s lost a lot of weight and completely wants to rework her image but going this route is hardly doing her any favors! One doesn’t have to wear expensive designer duds to look good, there are so many, many options. Step one is always choosing body-appropriate clothes. And in Divya’s case, that has to be stepping away from tube tops/necklines. Investing in some shoes wouldn’t hurt either. Even if its one basic pair, we wouldn’t mind looking at her wear it out event after event! Anything over these atrocities. We’ve always appreciated Neelam’s style of keeping it understated, simple and elegant but now we must say, she too is getting to be a bit predictable! As for this black dress, we don’t care for it all. Doesn’t stand out, not even in an understated way. So, we’ve seen this Louis Vuitton Minaudiere in purple, gold and black… Have a favorite? Not one for monograms, but I do like this minaudiere from LV; I heart the one in purple! ‘Ariel001’ spotted the gold Jimmy Choo Chrissie on Sonam Kapoor. 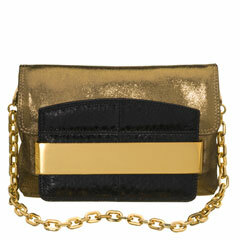 The bag is funky but I find it weird when people carry an evening bag with a chain as a clutch and leave the chain out. Just a ‘pet-peeve’. The worst offender though had to be Tanisha. Check her offense out here. Update: For some of you who missed our old post about her Anamika Khanna dress, check it out here.